Just Another Dog Blog: Internationalwho? Agility-Boxers: Internationalization; What it means to me! Bad Dog Agility: Episode 31: How Does Internationalization Impact Dog Agility? The Second Hand Dog: Internationalization: Raising the Bar or Building Barriers? Trials of an Agility Neophyte: Internationalization – a Dog Agility Blog Action Day post! Days of Speed and Slowtime Mondays: Internationalization-Why Should the Europeans Have All the Fun? Red Dogs Rule: INTERNATIONALISM – OH NO! The Brews Brothers: Forget the Handlers, What About the Dogs at the International Level? Susan Garrett Dog Agility: What Does Internationalization In Dog Agility Really Mean? DuncanDes: The Globalization of Agility? Peak Dogs: Internationalization…Backsides, Ketschkers and Threadles…Oh My! 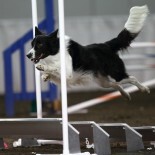 If you are a dog agility blogger please join us!